Mattress cleaning is often ignored when it bad or old mattress creates health problems and it affects all equally. Do you know according to a Non-Profit Organization – National Sleep Foundation, over 90% of the westerners know that the quality and condition for their mattress is directly proportional to their sleep quality? You literally spend one-third of your life curled up like a ball or laying like a log in your bed considering that you sleep for eight hours a day. Having said all that why would you not do the necessary which is needed for your mattress cleaning? In this blog, Toms mattress cleaning professionals will tell you how does bad mattress affect your health. The quicker you understand how old or bad and dirty mattress affects your health, the better. Shocking, isn’t it? A study conducted on 60 individuals showed that when these patrons after a month of sleeping in the old mattress, slept on a new mattress their stress level decreased significantly. The simple reason to that is, the irritability and discomfort you feel whilst sleeping in an old mattress increase your cortisol level. Lack of sleep also does the same, the entire day throughout. This is the most avoidable stress causing factor in your life, get old mattress cleaning today. As mentioned earlier you spend a significant amount of your time curled up in the mattress. While you sleep tossing yourself around inside the mattress you happen to shed some of your dead skin. And disgustingly enough this is the fodder for bed bugs and dust mites. These tiny creatures are the main causative factors for your respiratory allergies. If you do not clean and get rid of your old mattresses when you need to you should not wonder why have you ended up with a sore throat and a runny nose. Steam Clean your mattress and make it allergy free now! One of the biggest old mattress problems is that they cause a backache. Oklahoma State University in an experiment asked patrons to change their mattresses they had been using for five years. This resulted in them experiencing significantly less back pain. Several studies have proved it, and we know you have experienced it too. It is a fact that a medium firm keeps you from a backache compared to soft and firm type. Allergens, dust, mites and other dirt that gets percolated in the fibers of an old mattress can lead to many respiratory difficulties. The most general case is it blocks your breath and lack of oxygen is the direct cause of snoring. Deep clean your mattress today and make nights easier for your family. 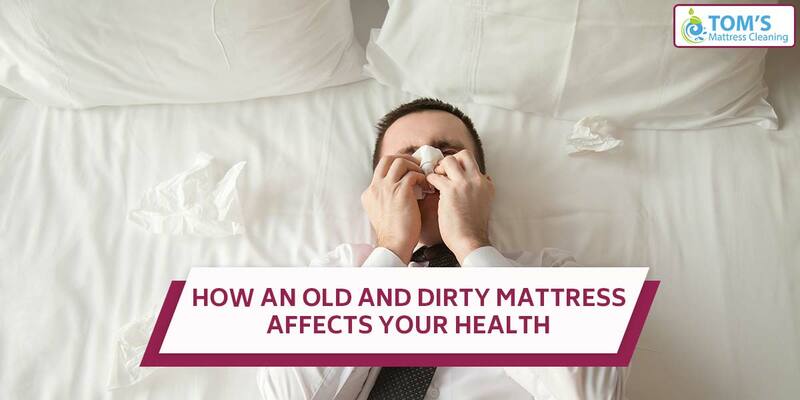 You now know how old and dirty mattress affects your health. Take quick action call a Toms Mattress Cleaning Melbourne to get your mattress inspected for free anywhere across Melbourne. Reach us at 1300 068 194.